The use of non-contact seals is not new, but variations in the types of non-contact seals have evolved rapidly in the last several years. The seals used for most bearings normally go unnoticed until something goes wrong - which could result in a forced outage or interruption in business. However, as life cycle costs become more important considerations, increased engineering attention is placed on optimizing the design of bearing seals. Technology innovations mean engineers no longer need to accommodate the limitations typically associated with the standard labyrinth seal. Increased engineering attention on optimizing labyrinth seals has produced a new breed of hybrid labyrinth seals, and an advanced centrifugal pressure seal. New technology has now made it possible to use non-contact seals in a whole new scope of applications, with benefits that include longer life, reduced wear, reduced heat buildup, and no parasitic drag. 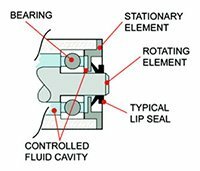 A seal is required to keep lubrication in and contaminants out of a cavity where lubricants are stored - a "controlled seal cavity." The non-contact seal is designed specifically for applications where lubrication must be kept from leaking out of a controlled fluid cavity located between two elements. A typical seal application involves a stationary element, a non-stationary (or rotating) element, and a controlled fluid cavity between these two elements (See Fig. 1). Traditionally, simple lip seals have been applied in this type of environment. Initially, non-contact seals were developed as a sealing method that would operate in extremely high shaft speed environments, or in applications where the durability of a traditional lip seal was limited. The contact lip seal has the stationary sealing element, or lip, in contact with the rotational element. This constant contact creates wear on both the lip and the rotating element, and adds significant parasitic drag to the system. In addition, operating speed is limited in these applications due to overheating and wear on the contact lip of the seal, as a result of rubbing between the rotating and non-rotating surfaces. Ultimately the seal lip will melt or centrifugally lift from the contact surface as operating speeds increase. The type of non-contact seal chosen for an application determines its specific benefits. The key to successfully employing any non-contact seal is to understand the sealing methods, and to select the appropriate seal configuration for each specific application. while the shaft is operating at its normal speed or within its operating speed range. There are several types of labyrinth seals. Typical labyrinth seals incorporate a "maze" or a set of rings in extremely close proximity, to capture the lubrication and push it back toward the controlled fluid cavity. Rings in close proximity form a barrier by shearing the fluid, centrifugally slinging the lubricants from the rotating seal element to the stationary seal element in a series of steps (See Figure 2). When the seal is not rotating, the controlled fluid cavity is open to the outside environment. The fluid that is contained in the seal can migrate to the bottom of the seal and possibly weep out of the seal. The length of time the seal is stationary will affect the amount of weepage. When the shaft is accelerating, the seal is accelerating and the fluid within the controlled fluid cavity must remain in laminar flow, or splashing will occur and the seal will leak. Splashing can be controlled somewhat by selecting a lubricant with high viscosity. The seal is designed to push the fluid back into the controlled fluid cavity, but it will also push any contaminants that have entered the stationary shaft into the controlled fluid cavity. The fluid level in the cavity must also be limited to ensure the fluid does not splash and flow past the seal. When rotating at the normal operating speed, the labyrinth seal pushes any fluid trying to exit the controlled fluid cavity back into the seal cavity. The normal speed range required will depend on the specific seal chosen but, in general, high speeds are required to maintain consistent behavior. During operation, the seal is open to contaminants entering from the outside environment. The rotating element and the stationary element in the labyrinth seal must remain axially aligned during operation and any axial movement between the two elements or vibration in the application could cause the seal to leak. The hybrid labyrinth seal has been modified by adding a contact seal component designed to centrifugally lift off the rotating shaft when the seal is operating at normal speeds. This modification solves some of the limitations of the standard labyrinth seal, and makes it function more like a contact lip seal. In addition, a lip seal component can be incorporated such that it will only make contact at lower speeds and will centrifugally lift from the contact surface at higher speeds. While the hybrid labyrinth seal does solve the problem of contaminants entering the controlled fluid cavity when the seal is not rotating, it adds challenges in mounting the seal and controlling axial movement, and reduces the efficiency of the seal by adding a contact element. When the seal is not rotating, the controlled fluid cavity is not open to the outside environment but some weepage is possible because the lifting mechanism must be capable of moving in and out radially. The fluid that is contained in the seal can also migrate to the bottom of the seal and weepage of fluid out of the seal is possible. The length of time the seal is stationary affects the amount of weepage. When the shaft is accelerating, the seal is accelerating and the fluid within the controlled fluid cavity must remain in laminar flow or splashing will occur and the seal will leak. Splashing can be controlled on a limited basis by selecting a lubricant with high viscosity. The seal will also have some parasitic drag torque until the contact element in the seal is centrifugally lifted from the contact surface. The splashing problems from acceleration and deceleration will be similar to those of the standard labyrinth seal when the seal is operating at speeds high enough to centrifugally lift the contact element from the rotating shaft. Operating speeds are critical to ensure proper operation of the seal. When rotating at normal operating speed, the hybrid labyrinth seal pushes any fluid trying to exit the controlled fluid cavity back into the seal cavity. The speed range required will depend on the specific seal chosen but, like the standard labyrinth seal, high speeds are required to maintain consistent operation. The seal is also open to contaminants entering from the outside environment, and the seal will push these contaminants into the seal cavity during operation. The rotating element and the stationary element in the labyrinth seal must also remain axially aligned during operation and any axial movement between the two elements or vibration in the application can cause the seal to leak. Centrifugal pressure seals are non-contact seals that utilize a rotating chamber within the seal to develop internal pressures and pump the sealing fluid back into the controlled fluid cavity. (See Figure 3). The double seal illustrated in Figure 3 will pump the contaminants out of the seal from the nonfluid side of the seal as well as pump the lubricating fluid back into the controlled fluid cavity. The rotating chamber method significantly reduces the operational speed requirements of the typical non-contact seal and allows the use of extremely low-viscosity fluids, even water. The more fluid that passes from the controlled fluid cavity into the rotating chamber, the greater the pressure inside that chamber to return the fluid to the controlled fluid cavity. The fluid in the controlled fluid cavity will continue to fill the rotating chamber in the seal, until the pressure from the fluid in the rotating chamber is in balance with the pressure in the controlled fluid cavity. At this point the seal will continue to move fluid in and out of the rotating chamber to maintain a pressure balance with the controlled fluid chamber. In the double seal arrangement, the controlled fluid cavity is only partially open to the environment or the non-fluid side of the seal. If contaminants enter the non-fluid side of the chamber while stationary, they will be pumped out of the chamber upon acceleration of the seal. Due to the wrapped chamber design, fluid does not leak from the seal in the stationary operation mode. When the shaft is accelerating or decelerating, the seal is not affected by any splashing of the lubricant. Splashing is prevented through a series of pumping discs located in the rotational chamber, which form a baffle to eliminate splashing and to keep the fluid in laminar flow at all times. The centrifugal pressure seal can operate with extremely low viscosity fluids such as water, without any leakage. Because the rotational chamber is located towards the outside diameter of the seal envelope and the fluid is captured in the seal rotational chamber, the seal is operable at much lower speeds than typical labyrinth seals. Splashing problems from acceleration and deceleration in the labyrinth seal are eliminated. When operating at normal speed, the seal is pumping any fluid trying to exit the controlled fluid cavity back into that cavity. The speed range required will depend on the specific seal chosen but in general, high speeds are not required to maintain consistent operation of the seal. The centrifugal pressure seal pumps contaminants from the non-fluid rotational chamber into the outside environment. This contamination can be in a liquid or gaseous state; the non-fluid chamber will still pump any contaminants out of the chamber. The seal has the additional feature of pumping and producing a pressurized controlled fluid cavity while in operation. This feature allows the controlled seal cavity to be completely filled with fluid, and as long as the seal is rotating, the fluid will not leak from the controlled fluid cavity. The design does not require the rotating element and the stationary element to remain in precise axial alignment during installation, maintenance, or operation. Some motion is tolerable from vibration and alignment. When the proper seal is selected, the rewards are significant compared to a standard contact lip seal. These benefits include low maintenance cost; no down time due to seal wear/parts failure; extremely high efficiency by eliminating parasitic drag torque placed on the rotating shaft; and finally increased bearing life due to reduced heat generation. ©The Carlyle Johnson Machine Company, LLC and Centritec Seals, LLC., all rights reserved. Information contained herein is intended for illustrative purposes only. Individual projects and applications vary significantly and valves should be specified for specific applications. 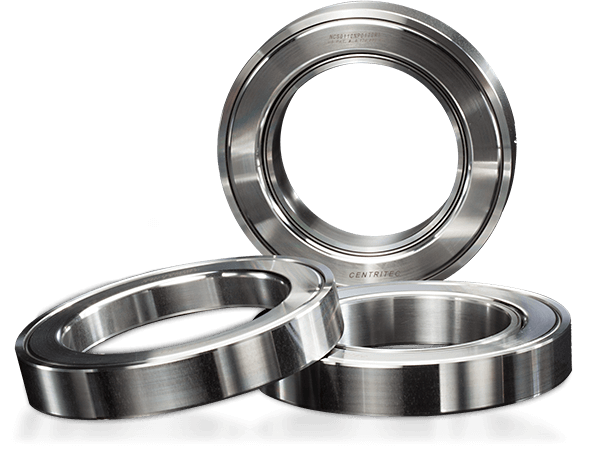 Contact Centritec Seals for more information on our centrifugal seal manufacturer services, or to request a quote for your application. Contact Centritec Seals today for more information or a quote for our non-contact shaft seals. ©2019 The Carlyle Johnson Machine Company, LLC. All Rights Reserved.